When do you hold your meetings inside a robot? When the robot is a conference room, of course. But is it a robot? Hiroshi Otsuka, SGI Japan's vice president for strategic business development explains, "Actually, it doesn't belong to the category of conventional industrial robots," he begins. "Also, this is different from two-legged robots. We do not want to cling to the definition. We want to use technology to develop something useful in our life." "Without having such new types of robot, it will be difficult for the robot market in Japan to continue growing." The robot he is talking about is the robot that senses the mood in a room and adjusts itself - the environment of the room that is - to match the occasion. If a meeting is too boring then the room pumps in fresh air and brightens the lights. If the discussion are getting too heated, the robot room softens the lights and sweetens the air with puffs of lavender as it plays calming music. The room uses SGI Japan's sensibility technology (ST) to read the mood of the humans. It can understand verbal commands. For example, when you say, "Let's begin the meeting," the room may close the shades and turn on the projector. But there is much more to understanding than just the words. Otsuka, "If the space robot was programmed to respond only to the meaning of words, communication between it and users would be limited." It uses the rhythm and tone of the voices as well as the content to figure out what is going on. It distinguishes a spectrum of six basic human feelings: laughter, calmness, sorrow, anger, joy and excitement -- and the current mix of each. 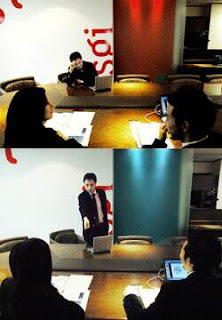 Spatial robot is not limited to conference rooms. Otsuka sees homes and hospitals also turning into space robots. For those who speak Japanese there is even an ST SDK available. Order Your Pleo Now. Not!